Jasmin: Sometimes the best travel deals (and memories) fall into your lap when you least expect it. 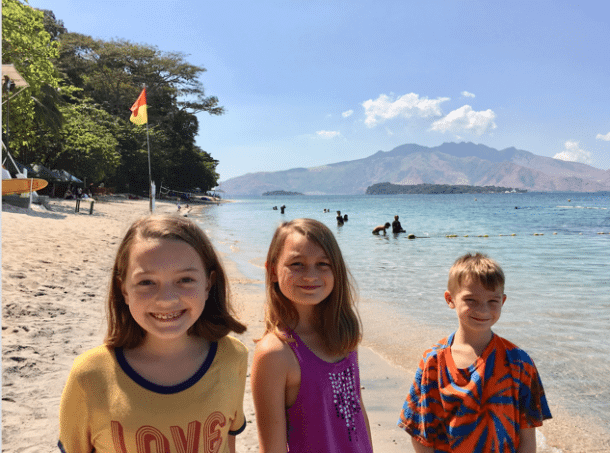 The kids, my mom, and I recently spent a night at Camayan Beach Resort in Subic Bay, Philippines. It was an unplanned stay – the hotel wasn’t even on my radar. 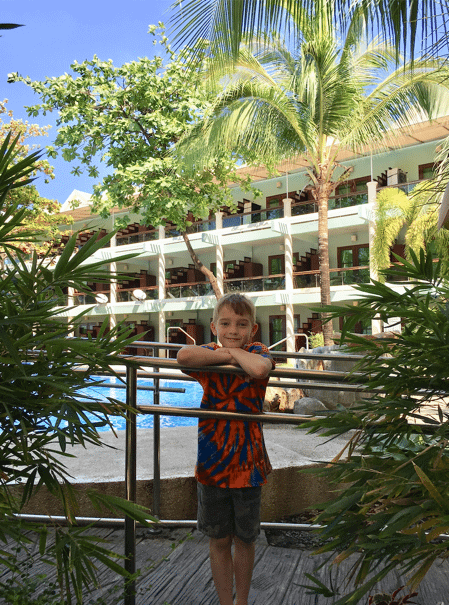 But we stumbled upon the resort after spending a day zip-lining at a nearby adventure park. We were so impressed we booked a night, even though I didn’t want to at first. And we didn’t even pay full price! 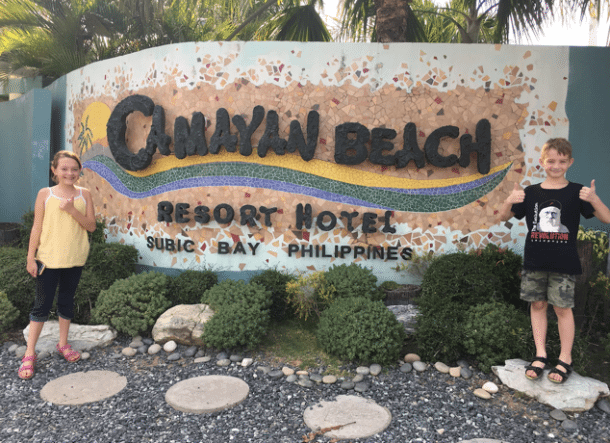 Here’s a quick review of Camayan Beach Resort. And more about how we got a discount. 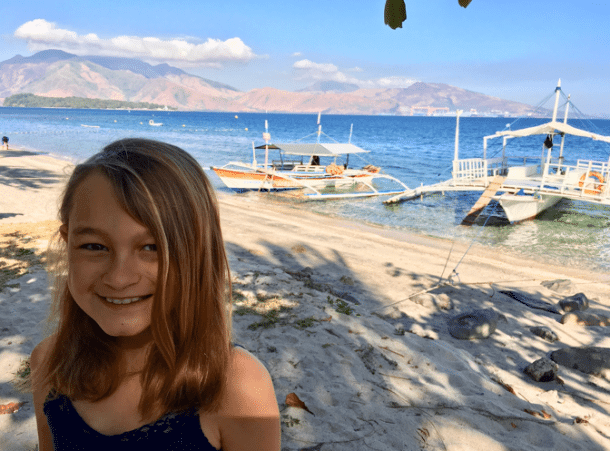 My kids and I spent much of our time on a recent trip to the Philippines at my family’s home in Floridablanca, Pampanga (~2 hours north of Manila). There’s NOT a lot to do there for children, and after ~1 week the kids were getting a little stir-crazy from just hanging out and visiting friends and relatives. Plus, the Wi-Fi was slow to non-existent at times (oh the horror)! 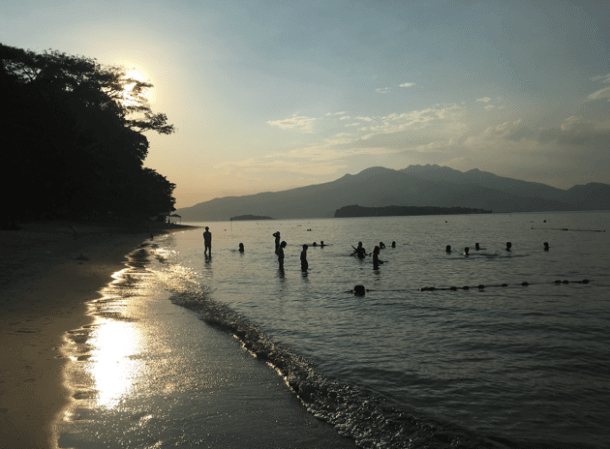 My mom suggested we change it up by taking a day trip to Subic Bay, the site of the former US Naval Base. It’s now a tourist destination geared to families, with adventure parks, aquariums, diving, beaches, and hiking areas. 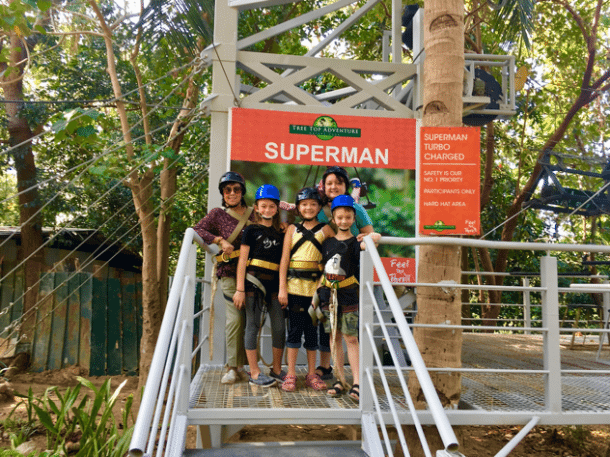 We visited Tree Top Adventure Subic, which was an amazing spot for zip-lining and jumping out of trees! 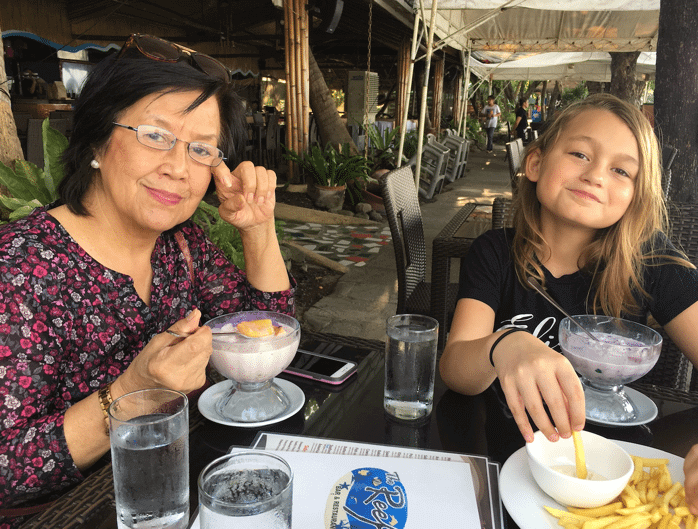 One of my mom’s friends recommended we stop for lunch at The Reef, the beachfront restaurant at Camayan Beach Resort, because of its scenic location and good, reasonably priced food. Our meal was tasty and inexpensive, and the kids appreciated being able to get pizza and french fries. We also had “halo-halo,” a traditional Filipino shaved-ice dessert. A quick check of the hotel rates online shut the idea down. For the 5 of us, we were looking at over $150 for the night. Not a horrible deal, but not exactly in the budget either. But then I remembered a trick team member Scott had mentioned to avoid paying full price for hotel stays. Sometimes if you call or ask at the front desk directly, you can get a discounted rate (especially if it’s last minute and they’re just looking to fill rooms). The hotel was fairly quiet, so on our way out I stopped by the front desk and asked if they had any discounts for later in the week. I’m so glad I checked. 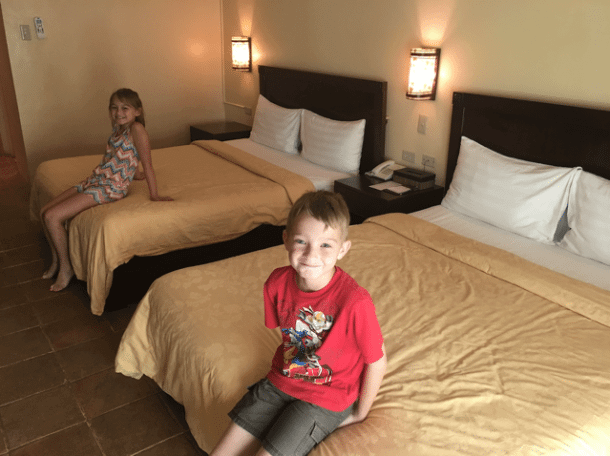 The front desk agent explained they currently had special rates available on account of it being low season and having 3 kids under 12 in our group. Additionally, my mom qualified for a senior citizen’s discount (she’s going to kill me when she reads this – sorry Mom!) which brought the rate even lower. All told, I was able to book one night later in the week for ~$105, including full breakfast for the 5 of us. The kids were positively thrilled! They didn’t even ask for a credit card to secure the room. Just my name and phone number. Two days later, we drove back to the resort for a mini-getaway. 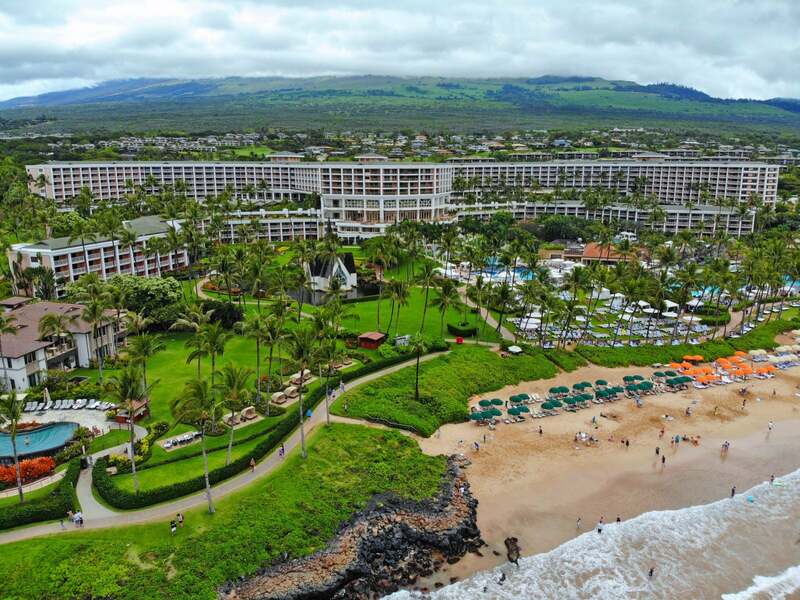 On check-in, the agent found the reservation and noticed the kids were very anxious to get to the pool and beach. She said that for ~$10, she could upgrade us to a premium poolside room with a veranda just a couple of steps from the pool, beach, and restaurant. I usually balk at upsells like this, but I thought it was totally worth it in this case. And the room location didn’t disappoint! I liked that I could sit and get work done while keeping an eye on the kids. And my mom appreciated a shady spot to relax and unwind while watching her grandchildren have a blast in the water. Surprisingly, after checking-out the next day, I noticed the charge came through as an amusement park purchase. 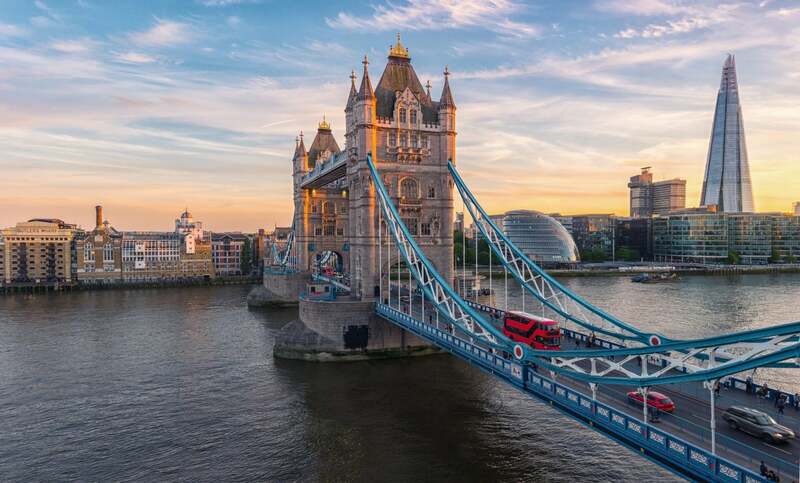 I’d used my Citi Premier Card to pay (it earns 3X Citi ThankYou points on travel, and – luckily – 2X Citi ThankYou points on entertainment, which includes amusement parks). I was glad I’d used that particular card. I would have been a little irritated if I’d used my Chase Sapphire Preferred Card instead, because I wouldn’t have earned bonus points for the stay. Or, if I’d wanted to use miles from the Capital One Venture Rewards Credit Card to erase this as a travel purchase, I would have been out of luck. Unfortunately there was no way to know or suspect this wouldn’t go through as a hotel charge! Outside of North America, budget-friendly resorts like this can be hit-and-miss. Especially if they’re not part of a chain. But we had an outstanding experience! The room was simple and comfortable, and more importantly, spotlessly clean. 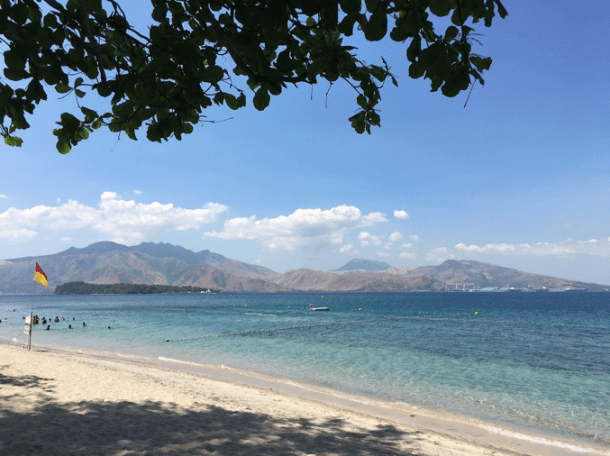 The views of Subic Bay and the surrounding mountains were gorgeous. The safe swimming areas were cordoned off, and there were lifeguards on duty to keep an eye on folks in the water. The Waves Were Generally Calm … Great for Kids! The kids stayed on the beach until sunset, making friends and horsing around in the sand and water. We had dinner again at The Reef restaurant. The food was decent, although my mom wasn’t a huge fan of the local-style chicken dish she ordered. 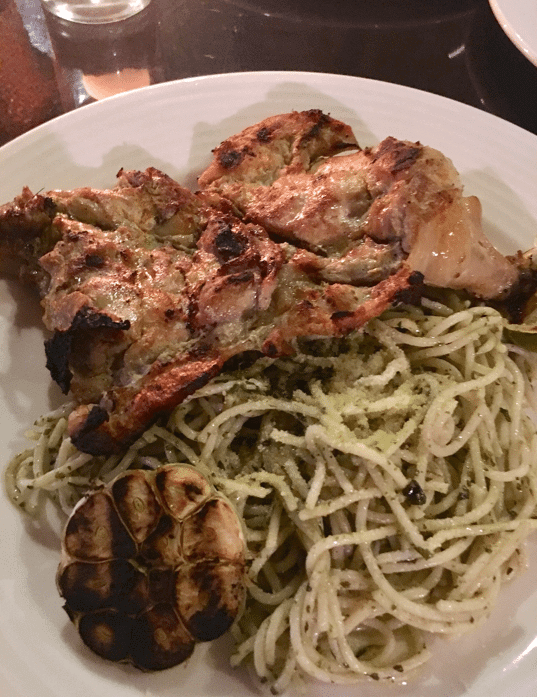 The kids enjoyed lemon-garlic chicken and pasta, a huge pizza, and several orders of french fries. The total bill before tip (including grown-up drinks!) was only ~$32 for 5 people. The next morning we pigged out on the complimentary full buffet breakfast. 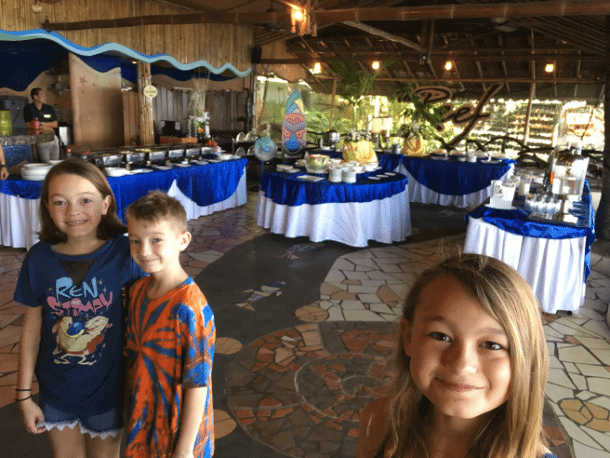 I was impressed with the selection of Filipino and Western dishes, which included garlic fried rice, eggs, various types of sausage and meat, pancakes, sweet rolls, fresh tropical fruit, veggies, cheeses, cold cuts, and more! After breakfast, we noticed tour boats ready to take visitors out on excursions in the bay. Unfortunately, we didn’t have time to try it out! Instead, the kids made a beeline for the pool. It wasn’t massive, but it had floating toys to climb up on and a small waterfall at one end. The landscaping and vegetation made it feel like little private oasis. The beach was mostly deserted, too. Not Quite a Private Beach, but Close Enough! 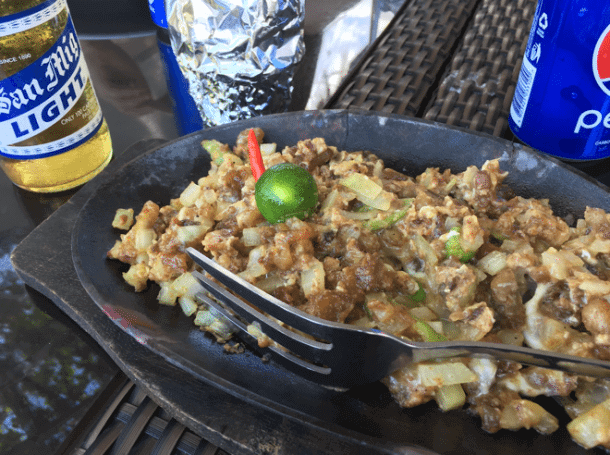 Sisig Became Popular Near the Former US Clark Air Force Base, and Is Now Known as a Good Match for a Cold Beer! I wish we’d had more time to explore the resort. But I’m so glad the kids convinced me to go off-plan and see if we could get a good deal! The resort wasn’t perfect. We had a couple of issues with slow service in the restaurant, and the room safe was broken so they had to send maintenance over. But it was safe, comfortable, and clean, with a chill vibe and terrific beach! And the Wi-Fi was very fast. Overall, I felt we got excellent value for the money we spent. And the kids are still talking about the fun they had! 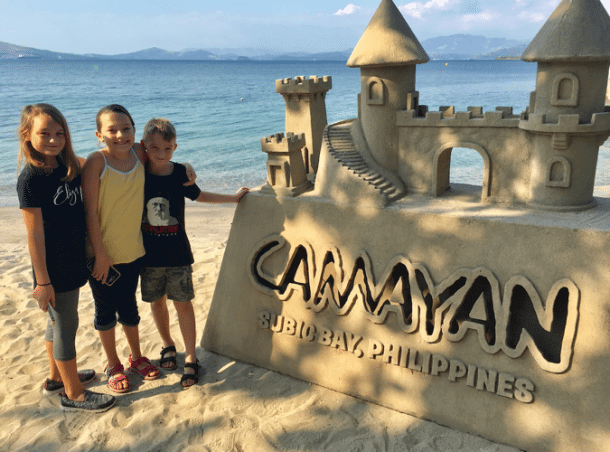 My family and I booked an unplanned, inexpensive night at Camayan Beach Resort in Subic Bay, Philippines. We’d stopped in for lunch and were impressed by the beautiful surroundings, landscaping, and beach. But I wouldn’t have booked it had I not asked personally at the front desk if there were any room discounts available. Because online, rooms were going for at least $150. Instead, they offered me a deal for an upgraded, poolside room including full breakfast for 5 people for ~$115 total per night. I’m usually not so spontaneous when I travel. But this showed me sometimes the most memorable experiences aren’t those you plan ahead for. My kids twisted my arm this time, and for that I’m very grateful! Come back each Wednesday for a new installment in our Family Travel series! 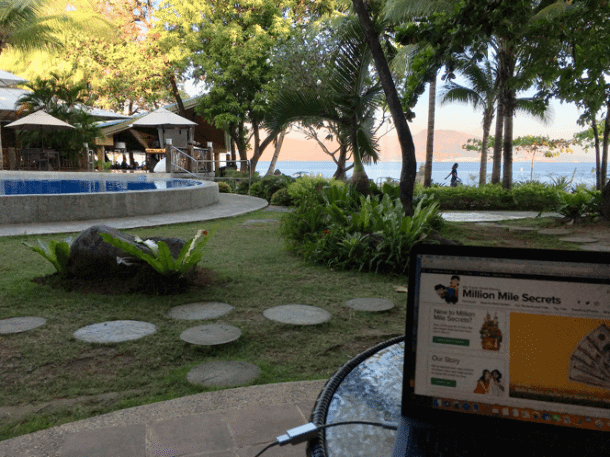 I’ll be writing more about some of our adventures in the Philippines. That’s great that you’re planning on going home! Any idea of the miles and points you want to use to get there? Happy to help out if I can. 1) It gave the kids something to do that they enjoyed. 5) She got to blog about the adventure and how to save on doing so, probably partial tax write off for work. 6) A whole lot cheaper then a day at Disney for one person. 7) It was on a whim and everyone had a good time and did not break the bank. Considering you were staying free at your family etc, even flying the 4 of, I don’t see the big difference between 150 and 105. I get it, the savings paid for free dinner that day, but the headline of the article made it seem you would’ve gone from 600+/night to maybe 200. The numbers I’m pulling out of a hat weren’t stated anywhere and maybe that’s just my head thinking, but 150 to 105 doesn’t seem like a deal so great to boast about. Thanks for the feedback! 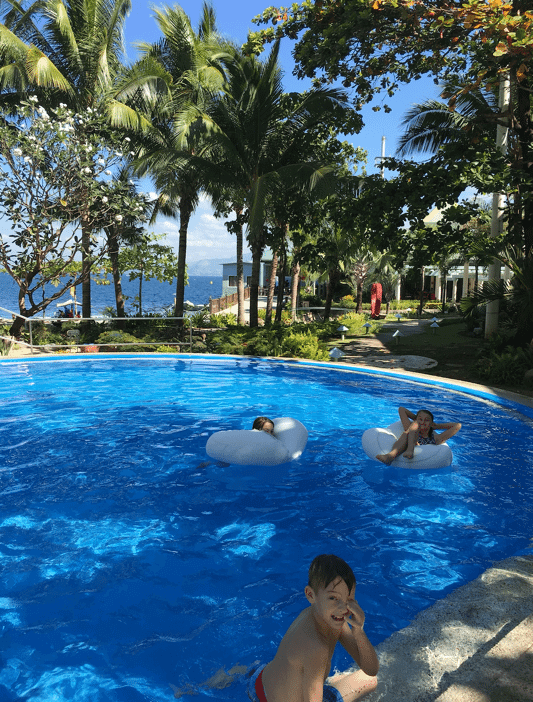 This wasn’t a whopper of a deal by any means, but getting a reduced rate just by checking with the hotel was easy (and pushed me into something that turned out to be a super experience for the family).